What are the Basics of the Exam? Learn what happens once you send in an application to sit for the Patent Bar, how to schedule your test date, and specifics of the computerized exam. Find out where the material on the exam comes from and what the currently tested version is. What Qualifications Do You Need to Take the Exam? Do you meet the requirements to sit for the exam? Find out here. The exam is difficult. It's based on the MPEP (which is thousands of pages of legalese). Don't go in un-prepared. Gain a few insights on how to study and move on with your life. Learn the steps to take to apply for the exam. What if the Unthinkable Happens and You Fail? It's not uncommon for people to fail the exam. The pass rates are fairly low and serve as evidence of this. Step-By-Step System. Online & Interactive Patent Bar Membership. Designed for individuals seeking a flexible study schedule without sacrificing quality. In-depth content, summaries and explanations. Simulated test environment with performance measurement. 100% Online Patent Bar Review. Peak at the Patent Bar review course. Try everything out and get started on the road to passing the Patent Bar. -- No credit card required. No obligation. 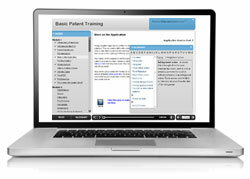 Enroll in the Patent Education Series review course. It's based on the current version of the MPEP and is completely updated for the America Invents Act (AIA).